Adrian Plass is the Anglican author of The Sacred Diary of Adrian Plass, Aged 37 ¾. It has sold millions of copies. His current novel flirts with questions of belief, lost hope, goodness, heaven, and the sustaining forces that allow one to get through life’s challenges. By his mere presence the Shadow Doctor makes it possible for the troubled to believe again in unseen forces, forces that make matters turn out right. Forces that persuade one to let go and not try to control outcomes. But Doc reads people’s souls. He assures Jack that his is a safe place. “You can take risks. You can say dangerous things.” And so the master and apprentice tackle a man who is being blackmailed. And then a “lady who thought she might explode,” a beautiful young woman who lost everyone close to her in a matter of months. With little effort they get her to laugh. 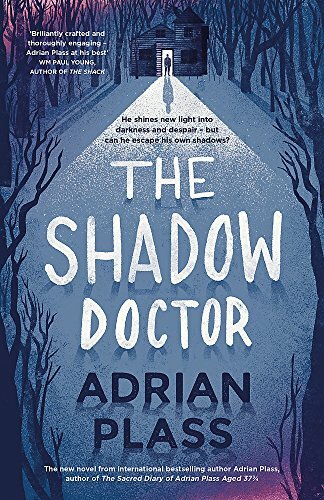 The novel’s end reveals the special long–deceased person who still tugs at the Shadow Doctor’s soul. A photograph he’s removed is the spitting—“I’d prefer to say kissing”––image of the woman he loved most. Now empty and searching, he needs Jack as a “travel companion” to help him on his strange yet beguiling pursuit of reading others’ souls and mending them.